If you read my email a few weeks ago, I told you about how I hit my back against the wall playing racquetball and had to go to the emergency room for what I thought was a stroke! (No worries, it ended up being a concussion). 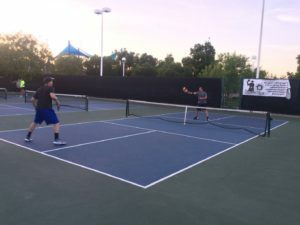 My brother and I competing in the pickleball event, where my training paid off. 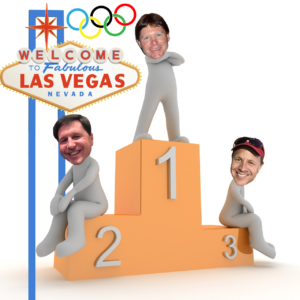 What I didn’t tell you was that this happened while I was training for what we call the “Las Vegas Olympics.” The Las Vegas Olympics is one of my favorite events every year. It is a competition between my brother, a best buddy from high school, and me, in nine different sporting-style events. We begin the Olympics with a game of racquetball. Since we have an odd number, the rules go like this: two of us start and play to eleven points. Then the winner stays on the court for the next game. This works out well because the winner becomes more and more tired as he continues to win…giving the other two an advantage. I am proud to say that I was the racquetball winner this year. I guess all my training (and medical bills) were worth it. All that raquetballing worked up our appetites. For lunch, my brother, who is the master of hunting out diamond-in-the-rough restaurants, found a Cuban fast food joint with a line out the door. We ordered way too much food, but so be it! We burnt plenty of calories that weekend. I was happy with 2nd because of winning tennis, racquetball and pickleball. Next, we headed to another hole-in-the-wall (again, brother’s choice) to play 9-ball pool. Usually, I would never go into a place like this; it sits in a huge, half-empty strip mall, is surrounded by weird stores, and the windows are either tinted or boarded up. But step inside, and we saw that it was reasonably nice. Good news for my brother: he took the win in pool. Bad news for my brother: it was his only win that weekend. Off to the go-kart races we went. Then, after a quick shower and dinner, we held the bowling event. The jam-packed day ended with a game of 21 (it is called the Las Vegas Olympics, remember). $100 and one hour to win. I can’t stand losing money, so I rarely gamble. I was out in about 30 minutes. Then my buddy said, “Hey, you can still bet even though you’re out.” I proceeded to lose another $80. That made it extra special. The next day was filled with tennis, batting cages, darts (Hey, I did say “sporting-style” events! ), and the grand finale of pickleball. Final results: My buddy took first, I was second, and my brother a distant third this year. My brother was semi-injured but no excuses, right? I wasn’t super disappointed because I won racquetball, tennis, and pickleball. My training paid off – even if it did cost me a trip to the ER and a concussion. What is it about beating the people you love that is so satisfying?